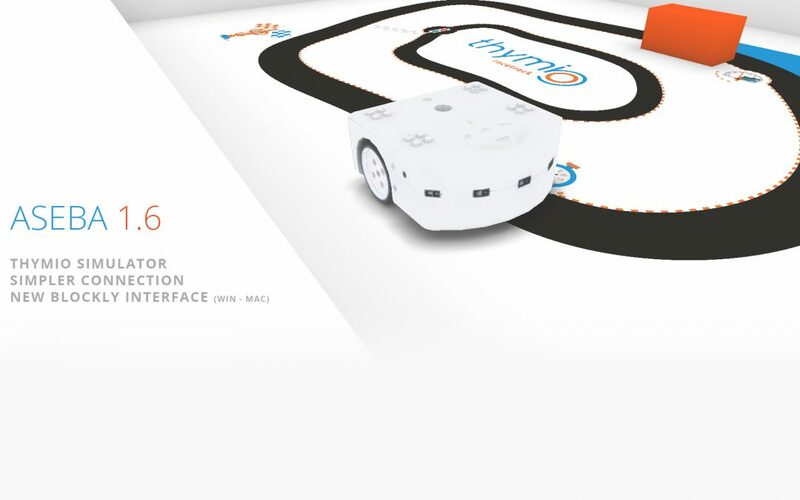 You want to program with Aseba and you don’t want to get your Thymio robot out of its box? Building on the Enki simulator by Stéphane Magnenat and colleagues, you can now program a simulated version of the Thymio robot wherever you want! The new connection interface discovers automatically the robots you connect to your computer. It also detects when a simulated robot is available and can even detect a robot over a network to set up a collaborative task like R2T2. This new tool allows you to connect a robot to a web interface, like Blockly or ScratchX. Blockly was moved outside Aseba Studio (except for Linux). It is now directly launched in your browser. Do not be afraid, it is installed locally, you do not need an internet connection. Challenge yourself to program your Thymio robot with the new ScratchX Extension to avoid obstacles, follow a line, avoid falling off a table and much more. You can also use Thymio as a controller and program a game on Scratch! It is now possible to unplug and plug in your robot without having to restart the programming interfaces. Download it using “Thymio Firmware Upgrader” to ensure compatibility with the new functionalities. This new release is the result of a collaborative work led by Stéphane Magnenat (ETH Game Technology Center), with contributions from David Sherman, Thibault Laine (Inria), Michael Bonani, Corentin Jabot, Vincent Becker, Elisa Bernardoni (Mobsya), Yves Piguet (EPFL Mobots) and other contributors (full list).